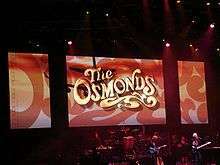 For the self-titled album, see Osmonds (album). The Osmonds are an American family music group with a long and varied career — a career that took them from singing barbershop music as children to achieving success as teen-music idols, from producing a hit television show to continued success as solo and group performers. The Osmonds are devout members of the Church of Jesus Christ of Latter-day Saints, and their religious values have influenced their careers. The Osmond family was not one single act, but a group of several. The Osmond Brothers began as a barbershop quartet consisting of brothers Alan, Wayne, Merrill and Jay Osmond. They were later joined by younger siblings Donny and Jimmy, both of whom enjoyed success as solo artists as well; with Donny, the band became known as The Osmonds, under which the band enjoyed its greatest pop success. Their only sister Marie, who rarely sang with her brothers at that time, launched a successful career in 1973, both as a solo artist and as Donny's duet partner. A revival of the original Osmond Brothers lineup in the 1980s achieved moderate success in country music and continues to perform to the present day (with Jimmy having since replaced the semi-retired Alan and Wayne), as do Donny and Marie. Collectively, the family has sold 102 million records worldwide. The siblings' older brothers George Virl Osmond, Jr. (Virl) and Tom Osmond were born deaf and did not originally perform. They made several television appearances in later years, most notably on the family Christmas specials in the 1970s. All of the Osmonds were born in Ogden, Utah except the youngest, Jimmy, who was born in Canoga Park, California. While the Osmond Brothers were performing on a televised Disney special, Andy Williams's father saw them and was so impressed he told his son to book them for his television show. Andy did, and the Osmond Brothers were regulars on the show from 1962 to 1969, where they earned the nickname "one-take Osmonds" among staff due to their professionalism and tireless rehearsing. Donny soon joined them on the show, making the Osmond Brothers a 5-member group. Marie and Jimmy were also introduced on the show as the years went by. During this time, the Osmonds also toured Europe, performing with Sweden's most popular singer, Lars Lönndahl, and even releasing a single where they sang a Swedish version of "Two Dirty Little Hands" ("Fem smutsiga små fingrar"). The Osmond Brothers were regulars on the Jerry Lewis Show in 1969 and they continued to tour and perform with Andy Williams. But soon the Osmond Brothers decided they wanted to perform popular music and shed their variety-show image. They wanted to become a rock and roll band. The change was a difficult one for their father, who was suspicious of rock and roll. But he was persuaded and the boys began performing as a pop band. To this end, the Osmonds recorded a single, "Flower Music", for UNI records in 1967. They achieved only modest success at first, but they found fame in 1971. Record producer Mike Curb saw the Osmonds (no longer called "The Osmond Brothers") perform as a band and recognized that they combined a rare mix of polished performing style, instrumental skill, and vocal talent. He helped the Osmonds get a record contract with MGM and arranged for them to record at Muscle Shoals with R&B producer Rick Hall. Under Hall's guidance, the Osmonds hit the top spot on the pop chart with "One Bad Apple" in 1971. The song, "One Bad Apple", written by George Jackson, who had The Jackson Five in mind when he wrote it, was originally presented to Motown Record’s Chairman of the Board, Berry Gordy, for The Jackson Five to record, but he turned it down. 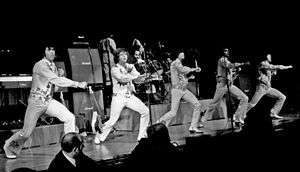 It was then presented to MGM Records for The Osmonds, who were the white version of The Jackson Five that had the same Bubblegum sound and style of music, and it became their first number-one hit single released on November 14, 1970. The Osmonds soon had hits with other light, R&B-style pop numbers like "Double Lovin'" (#14) and "Yo-Yo" (#3). In each of these hits, the formula was the same; Merrill sang lead, and Donny was "co-lead" in essence, singing the "hook" or "chorus" of the song. At this time the Osmonds also recorded several hits that were billed to Donny, the lead soloist on the songs: "Sweet and Innocent" (#7), "Go Away Little Girl" (#1), "I Knew You When" (#9) and "Puppy Love" (#2). The Osmonds were at their peak of popularity. But this "bubblegum soul" phase was about to end, as the Osmonds began writing their own music and their sound moved towards rock-and-roll with hits like "Down by the Lazy River" (#4), "Hold Her Tight" (#14) and "Crazy Horses" (#14). The Crazy Horses album was the band's first really personal statement — the brothers have been quoted as saying that the title song refers to air pollution from cars. They wrote all the songs and played all the instruments with Alan on rhythm guitar, Wayne on lead guitar, Merrill on lead vocals and bass, Jay on drums and Donny on keyboards. All the brothers sang backing vocals, with Jay and Donny sometimes singing lead parts. Perhaps part of the reason that the original formula of Merrill singing lead and Donny singing co lead was abandoned on these songs, was due to the songs being a bit more on the harder side of pop. But perhaps a larger reason was Donny's voice had changed. With their clean-cut image, talent, and energetic pop-rock sound, the Osmonds toured to crowds of screaming fans in the US. They even had their own 1972–1973 Saturday-morning cartoon series The Osmonds on ABC-TV. By this time the Osmonds had broken through in the UK as well: counting group and solo recordings, members of the Osmond family charted 13 singles on the UK charts during 1973. Some observers coined a new word, "Osmondmania", to describe the phenomenon, by analogy with the similar "Beatlemania" of nearly a decade earlier: the same type of hysteria was generated at their concerts during this period. But changes and challenges soon arrived. In mid 1972, thirteen year old Donny's voice had changed. This was a major upset to the groups formula that had proved so successful. Not only did this eliminate Merrill's young-sounding co-lead's voice (forcing Merrill's already mature tenor voice to strain to cover most of the higher notes, with audible difficulty, through the next few years), but it also ended Donny's bubble gum like ballads, which became so popular with fans. With this development, Donny spent much of 1972 and then 1973 touring but singing his old songs with his new voice, although the success of "Hold Her Tight" (#14) and "Crazy Horses" (on which Donny did not sing) kept the group very popular through 1973. But then, another change and challenge: The older boys were of age to go on church missions, yet they believed they could reach more people through their music. They recorded an ambitious album in 1973 called The Plan, perhaps best described as a Mormon concept album with progressive rock aspirations. One reviewer suggested that The Plan carried a too-strong religious message—Mormonism is, after all, fairly conservative and not usually associated with the themes of rock-and-roll. He likewise suggested that the music was too varied and experimental. The album produced only two minor hits: "Let Me In" and "Goin' Home" (both #36 in the USA, although they both went top 5 in the UK and "Let Me In" was also a major hit on the easy listening charts). Furthermore, the older boys may have wanted to reduce the regular touring that is a necessity in popular music but not so good for marriage. But "The Plan" was a major departure from the pop music which made them so popular. The combination of this album, along with Donny's voice change, meant that with young fans the Osmonds popularity would soon wane. Donny, and to a lesser extent, Marie and Jimmy, soon began to emerge as solo artists. Jimmy was becoming “big in Japan,” and in 1972 had a #1 hit in the United Kingdom with "Long Haired Lover from Liverpool". Marie, then 13 years old, hit #1 on the US country chart in 1973 with "Paper Roses" (a song originally recorded by Anita Bryant a decade prior). Donny had a string of pop hits with a string of covers of earlier teen-pop songs, including "Go Away Little Girl" (#1, originally by Steve Lawrence), "Puppy Love" (#3, a Paul Anka composition) and "The Twelfth of Never" (#8, originally recorded by Johnny Mathis). From 1971 to 1976, he had 12 Top 40 hits, including 5 in the Top 10; for most of these, the Osmonds were still performing as a full band, but backing and giving star billing to Donny for songs on which he sang lead. Donny's popularity, and his numerous solo hits, have led many to assume he was the group's lead. Merrill was nevertheless the usual lead singer; Donny would usually sing the choruses on songs billed to The Osmonds, thus being a "co-lead". (The family resemblance between Donny and Merrill at the time likely made the confusion worse; in later years, Merrill grew out his beard and let his hair go gray to distinguish the two.) Donny's emergence as a solo star and the record company's desire to appeal to the teen-girl audience often thrust Donny out in front of the group. By now the family was touring, recording, creating and producing for five technically separate artists: The Osmonds, Donny Osmond, Marie Osmond and Jimmy Osmond — plus Donny and Marie had begun recording duets and had hits with "I'm Leaving It Up to You" (#4) and "Morning Side of the Mountain" (#8). Through all the stress and pressures created by these many efforts, the family hung together. The 2001 ABC-TV movie Inside the Osmonds depicts the family mottoes as being "It doesn't matter who's out front, as long as it's an Osmond" faith,family and career. In that order". The original Osmonds as a group still produced hits. In 1974, "Love Me for a Reason" reached #10 in the US and #1 in the UK. The Irish boy band Boyzone took the song to #2 in the UK in 1994. By 1976, though, the group's record sales were softening; Osmondmania had faded and been replaced by "Rollermania," as the Bay City Rollers became the hot pop band of choice in the mid-1970s. The Osmonds poured themselves into a new venture: the older brothers began producing The Donny & Marie Show which was a hit on ABC from 1976–1979. But the success came at a cost. The family built and operated at great expense a first-class television studio in Orem, Utah, where the show was produced beginning in 1977. As a result, the Osmonds as a performing band became a lower priority to Donny and Marie. The older brothers deferred or gave up their dreams of being a rock-and-roll band. Donny experienced stage anxiety and Marie had a brief bout with an eating disorder after a network executive told her she looked heavy. When the show was cancelled, the Osmonds were taken by surprise, as they had believed that the show would be renewed, and found themselves in debt and without a clear direction. They recovered and eventually paid their debts and re-established their careers. Rather than go into bankruptcy, they resolved to honor all of their financial obligations. But the Osmond artists and enterprises began operating separately. The Osmonds performed together in 1981 at The Front Row Theatre in Highland Heights, Ohio. This included all the brothers as well as Donny, Marie and Jimmy. Jay Osmond is the primary choreographer for the Osmond's concerts and some television concerts. Jimmy worked as a businessman and manager. He eventually moved to Branson, Missouri, and opened the Osmond Family Theater, where he and his brothers performed until 2002. They appear in Branson during the Christmas season. Marie recorded a number of successful duets with Donny and continued to sing country music; she had several Top 40 country hits in the mid-1980s, the biggest of which was "Meet Me in Montana" with Dan Seals (#1). She starred in the Broadway musicals The King and I (as the lead, Anna) and The Sound of Music (as the lead, Maria) in the mid-1990s. She returned to television first in the short-lived 1995 ABC sitcom Maybe This Time and then with Donny in 1998 to co-host Donny & Marie, a talk/entertainment show that lasted two seasons. Marie suffered from postpartum depression and wanted to help other women who suffered from it. In 2001 Marie, Marcia Wilkie and Dr. Judith Moore wrote a book on postpartum depression titled, Marie Osmond Behind the Smile. Marie remarried her first husband Stephen Craig in 2011. She was able to wear the same wedding dress after 26 years. Donny returned to the pop music scene in 1989; when he released "Soldier of Love" to much success in the UK, American music industry insiders were wary of the Osmond brand and promoted the song as being by a "mystery artist." The song indeed became a turntable hit in this manner, and when Osmond's identity as the mystery artist was revealed, "Soldier of Love" eventually rose to #2 on the U.S. charts and was enough of a success to warrant a follow-up single, "Sacred Emotion," which peaked at #13. He performed on Broadway as Gaston in the stage production of Beauty and the Beast, and also gave over 2,000 performances as Joseph in the touring production of Joseph and the Amazing Technicolor Dreamcoat. He has hosted games shows in the US and UK (most notably the 2002-2004 revival of Pyramid and the British version of Identity), continues to appear on television, winning the ninth season (Fall 2009) of ABC's Dancing with the Stars, and still tours in the US and England. Since September 2008, Donny & Marie have been performing a 90-minute show four nights a week, for a couple of weeks each month, in the showroom of The Flamingo Las Vegas. Alan, Wayne, Merrill and Jay formed a country group and returned to using the name "The Osmond Brothers". They had two top-30 Billboard Country hits in the early 1980s: "I Think About Your Lovin'" (#17) and "It's Like Fallin' in Love (Over and Over)" (#28), in addition to a handful that reached the bottom of or narrowly missed the top 40. The Osmond Brothers' record sales were hampered by a reluctance to go on tour; the group instead opted to stay in Branson, Missouri and promote their music through promotional music videos. The brothers continue to perform with various line-ups and sometimes with their children in Branson. Merrill performs and records as a solo artist as well; his biggest hit independent of his siblings was a duet with Jessica Boucher, "You're Here to Remember, I'm Here to Forget," a piece Merrill specifically chose to break from his family-friendly image (like Donny, Merrill had to hide his Osmond identity and recorded the song under the name "Merrill and Jessica") and which became a hit on the country charts in 1987. Alan has multiple sclerosis, and does not perform as often today; likewise, Wayne, who survived a brain tumor in 1997, retired from the group in the early 2010s. All of the brothers are married, some with large families. Alan's eight sons started performing in the mid-1980s as "The Osmond Boys", now known as "The Osmonds—Second Generation". In 2007–2008 all of the Osmonds went on a tour of Europe to celebrate the fiftieth anniversary of their career in show business. A special televised concert in Las Vegas (the only tour stop in the US), commemorating the anniversary, aired on US PBS stations on March 10, 2008. Alan played piano with the orchestra for most of the show and Virl and Tom provided signed lyrics for two songs. The Osmonds' long-time friend and mentor Andy Williams made a surprise appearance, reminiscing about how his father had told him to put the brothers on his variety show. In 2009, Donny and Marie Osmond recorded a television special for the British channel ITV1: An Audience with Donny and Marie, part of ITV's long running An Audience with... series was based on their Las Vegas stage show. In 2011, Wayne, Merrill and Jay performed in Findlay, Ohio on December 11. They performed some of their old songs as well as some Christmas music. They walked in the audience during part of the concert making it a family friendly concert. As of 2015, Donny and Marie currently perform some in Las Vegas and some traveling around the world, with Alan's son David Osmond occasionally filling in for Donny. Merrill, Jay and Jimmy also sing together at the Suncoast Hotel and Casino in Las Vegas, along with some limited touring, mostly in the UK. Since Andy Williams's death, Merrill, Jay and Jimmy took over operations of his long-running Christmas show, which they perform in Branson, Missouri in November. Olive Osmond, mother of the Osmond siblings, died on May 9, 2004 at age 79. Their father, George Osmond, died on November 6, 2007 at age 90. The couple was survived by their nine children and 55 grandchildren as well as a number of great-grandchildren, Olive by 22, George by 48. Before George Osmond's death, plans were being made for him and the 120+ members of the Osmond family to appear on The Oprah Winfrey Show to celebrate the family's 50th anniversary in show business. He died just a few days prior to the taping. The family ultimately decided to go on with the show as scheduled, and on Thursday, November 9, the entire Osmond family appeared on stage with Oprah Winfrey as a tribute to their father. The show aired the following day, the same day as George Osmond's funeral. In 2003, the Osmond Family was honored for their achievements in the entertainment industry with a star on the Hollywood Walk of Fame. Until 2008, The Osmonds' 1960s and 1970s albums had never been released on CD legitimately in any country. Several 2-for-1 bootleg collections have been released on all of the original catalogs. Most notably the first and original four-album sets released on the Maestro label. Maestro released the albums as an original master series with hard-to-find bonus tracks in top quality sound. Each set contained four albums on two CDs with all original album covers and MGM label art work intact. The albums were finally reissued in 2008 by British label Cherry Red Records offshoot imprint, 7t's, beginning with 1971's Osmonds / Homemade and wrapping up the series with 1975's Around the World – Live In Concert. "I've Got Loving on My Mind" — — — — — — — "Mollie - "A""
1969 "Taking a Chance on Love" — — — — — — — "Groove with What You Got"
"Movie Man" — — — — — — — "Traffic in My Mind"
1975 "Having a Party" — — — — — 28 85 "Sun, Sun, Sun"
"I'm Still Gonna Need You" — 38 — — — 32 — "Thank You"
"Steppin' Out" — — — — — — — "Put Your Love on the Line"
"It's Like Falling in Love (Over and Over)" — — 28 — — — — "Your Leaving Was the Last Thing on My Mind"
"Never Ending Song of Love" — — 43 — — — — "You'll Be Seeing Me"
↑ "The Osmond Brothers at Disneyland". YouTube. 2007-07-23. Retrieved 2011-08-07. 1 2 3 4 5 6 7 8 9 "History". Osmondbros.com. Retrieved 2011-08-07. ↑ "The Osmond Brothers - Fem smutsiga små fingrar (1965)". YouTube. 2008-11-02. Retrieved 2015-08-25. ↑ "The Osmonds (video) Goin Home". YouTube. Retrieved 2011-08-07. ↑ "Donny & Marie Live at Flamingo Las Vegas Hotel and Casino". Flamingolasvegas.com. Retrieved 2015-08-25. ↑ "Osmonds Branson Show". Bransoninfo.org. Retrieved 18 September 2014. ↑ "Welcome 2ndg.com - BlueHost.com". 2ndg.com. Retrieved 2015-08-25. ↑ McMahon, Kate (2009-08-11). "Osmonds to reunite for ITV1 special | News | Broadcast". Broadcastnow.co.uk. Retrieved 2011-08-07. ↑ Nudd, Tim (2007-11-06). "Donny and Marie Osmond's Father Dies". People Magazine. Retrieved 2010-11-30. ↑ Archived August 7, 2014, at the Wayback Machine. Wikimedia Commons has media related to Osmond family.